This set uses sports detailed embroidery and appliques including baseballs, footballs and soccer balls. Sweet Jojo Designs All Star Sports 5 pc. 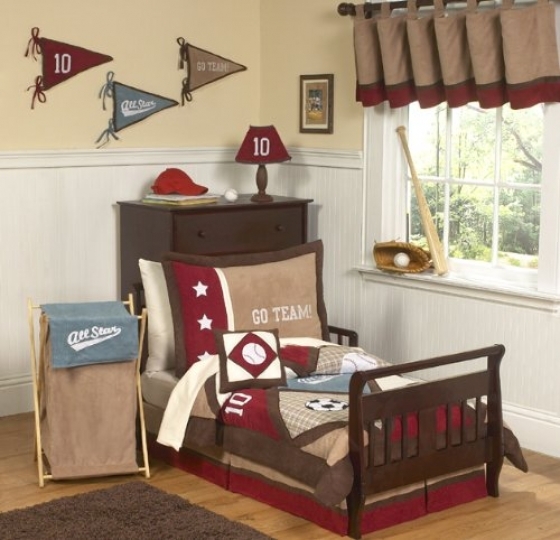 toddler bedding ensemble will create a fun sports theme room for your child. This striking set uses a collection of 100% Cotton fabrics combined with super soft Microsuede Fabrics. The coordinating fabrics include Chocolate, Blue, Brick Red, and Cocoa Microsuede fabrics, combined with ivory cotton and brown plaid cotton. Throughout this set are sports themed detailed embroidery and applique works. This set does not come with the bed skirt, one may be added, Please see accessories for this set.